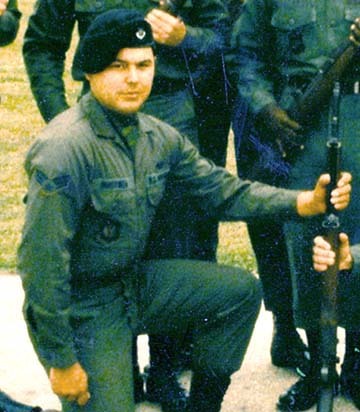 September 15, 2015 - Albuquerque, New Mexico - One of the men with John Burroughs during the early morning hours of December 28, 1980, during John's second encounter with the unidentified aerial phenomena in Rendlesham Forest was D Flight Security Sergeant Adrian Bustinza.The following is a continuation of our PHENOMENON Radio interview on August 27, 2015, when Adrian spoke for the first time on radio about what he remembered that night of high strangeness in England near RAF Bentwaters/Woodbridge. One of Adrian's most important revelations was the intimidating threat he received afterward in which a backlighted figure in silhouette ordered Sgt. Bustinza to lie about what he had seen. Live KGRA web radio Thursday nights 5 -7 PM Pacific / 8 -10 PM Eastern. Sergeant Adrian Bustinza. Photograph © 1980 by Lori Buoen.